This 2017 Galeon 560 Yacht needed a new dingy cover. Here at Chicago Marine Canvas we specialize in custom covers therefore, none of our covers are the same. They are all different to ensure that each one fits the boat in need properly. We also use many labor-saving tools that help us do things quickly. This saves you money at the end of the day on the perfect cover. The first step to our process is to head out to your boat to take measurements with our 3D measuring device. After we gather precise measurements we head back to the shop to start our design process on the computer. We do all of our design work using CAD (Computer-Aided-Design) Software. Because we are working on the computer we can see exactly what we are creating in 3D. 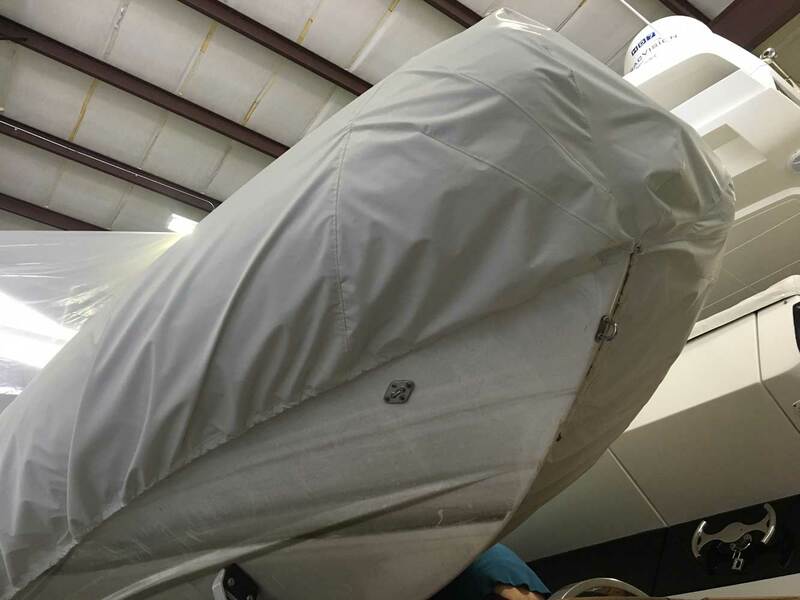 This allows us to create the perfect fitting cover for your boat. After the cover is designed, we draw it out using our plotter. This draws out all the pieces of the pattern perfectly so our seamstress can sew it up! This dingy cover was created out of Stamoid. 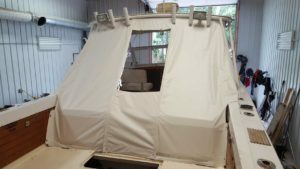 Stamoid is a great material to make a boat cover out of. It is water, UV, and stain resistant. We used SolarFix thread in clear to sew this all together. Solarfix is a PTF thread which is also, UV, chemical, and mildew resistant. Which means, that you’d never have to bring your new dingy cover in for restitching after it’s been out in the sun for a few summers! Finally, on the bottom of the cover we did a draw cord. As a result, the cover can tighten around the dingy keeping the cover nice and secure, and your boat dry! 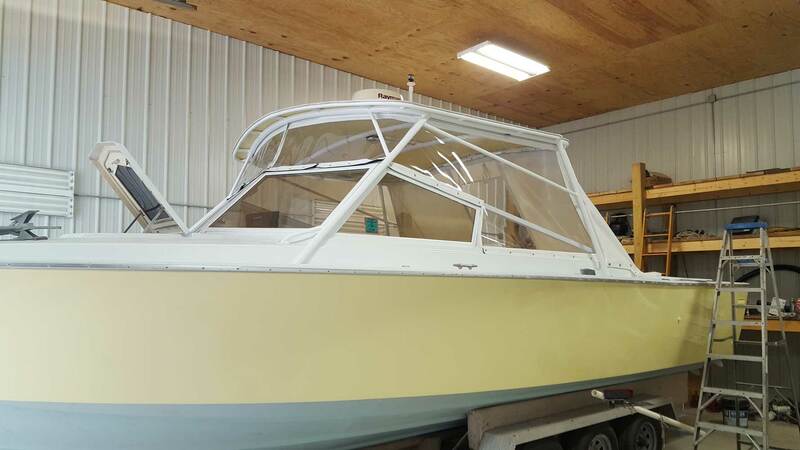 For this refurbished Bertram 30′ we created a custom full enclosure to keep this boat dry no matter what the weather has in store for you. 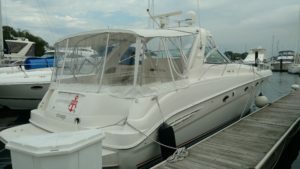 Here at Chicago Marine Canvas we use many labor-saving, cost-effective tools that help us speed up our process. We first go out to your boat to take precise measurements using our 3D measuring device. Then we head back to the shop and start our design process. We do all of our design work on the computer using CAD (Computer-Aided-Design) Software. Here we can visually see how the new enclosure will look, before we even begin the sewing process, that way we can make any custom adjustments you want. After that, we send the design to our plotter, which is another one of or labor-saving tools, that quickly draws out all the pieces of your new enclosure. This saves our seamstress so much time while also making sure everything is precisely cut and drawn to the right size. For this enclosure, we used Stamoid fabric in white. Stamoid is UV, water, and fold resistant. It’s very easy to clean with just water! Check out this video to see Stamoids performance testing videos! For thread we used Solar Fix which is a PTFE or a Polytetrafluoroethylene type of thread, which is also known as teflon, that is guaranteed for life! That means you can say goodbye to repairs that involve restitching. With this thread, your seams will last a lifetime! Solarfix doesn’t get eaten by the sunlight, salt water, or other outside elements. For the glass on this enclosure we used Strataglass. For some tips on how to clean strataglass to maintain its life check out this link. 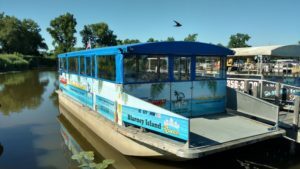 (New Orleans, LA – Sept. 28, 2017) – Chicago Marine Canvas, Chicago, Illinois, was recognized with the 2017 International Achievement Award (IAA) for design excellence in specialty fabrics applications. 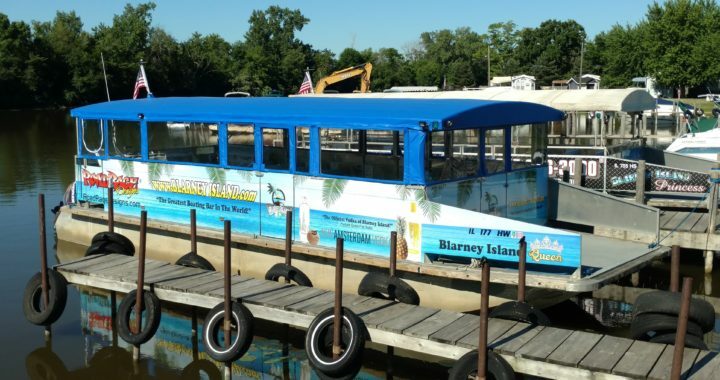 Chicago Marine Canvas received an Award of Excellence for its Blarney Island: Keeping the Customers Warm project. 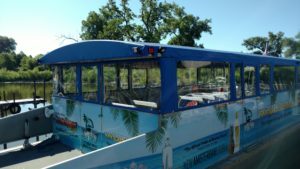 The project was recognized in the competition’s Powerboat-Rigid Enclosures category. For seven decades, IAA has recognized excellence in design and innovation, highlighting truly spectacular work in the specialty fabrics and technical textiles industry. The International Achievement Awards competition is sponsored by IFAI, a not-for-profit trade association who’s over 1,600 member companies represent the growing international specialty fabrics and technical textiles marketplace. IFAI received a total of 235 entries from 11 countries that were submitted for 42 categories in this year’s competition. Winners were selected based on complexity, design, workmanship, uniqueness and function. Judges included industry experts, editors, architects, educators and design professionals who were chosen for their knowledge in a particular field of study or product area. For photos and a detailed project description, visit https://iaa.ifai.com/awards/177746/. We aren’t your typical canvas shop. 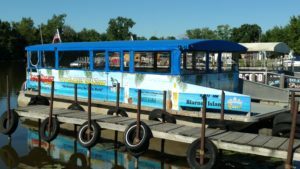 Here at Chicago Marine Canvas we use lots of labor-saving, cost-effective tools! For all of our jobs we use our 3d measuring device to help save us time and you money. 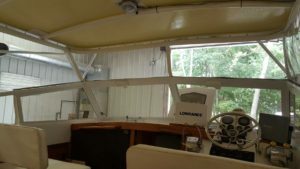 We do all custom cockpit covers, full enclosures, upholstery work, canvas repairs, zipper replacements, window replacements and vinyl flooring. After we gather our measurements, we go back to the office and pop on the computer and start our design process using our CAD (Computer-Aided Design) program. 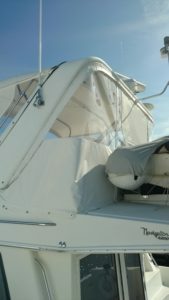 Here we can easily customize your cover adding windows, zippers and fasteners. Our CAD program takes into consideration the relaxation of the fabric and other variables which would take days, and multiple trips out to your boat to figure out manually. 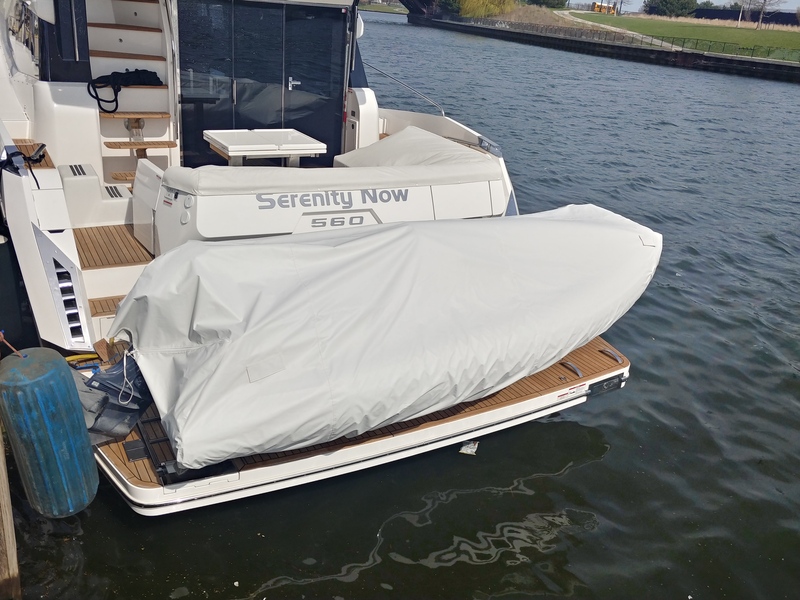 At the end of your experience with us, your cover will fit your boat perfectly. We promise to deliver these solutions on time and within budget! 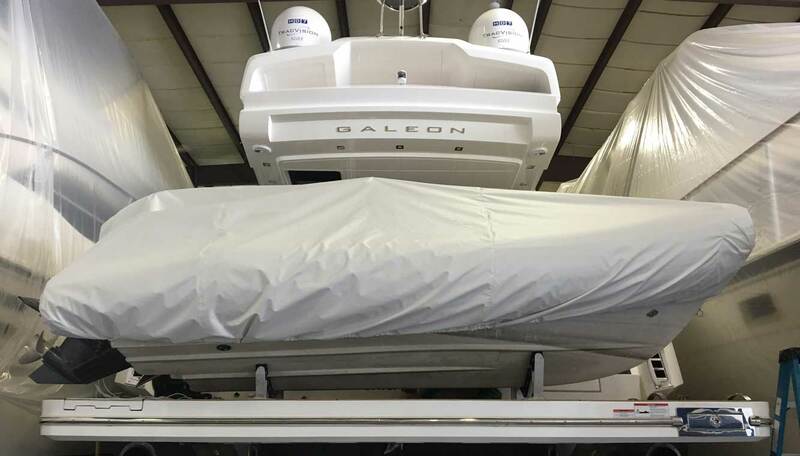 We work on Sea Ray, Rinker, Regal, Tiara, Maxum, Four Winns, Baja, Cruisers Yatchs, Wellcraft boats and more!! Visiting Chicago from Florida for the summer. 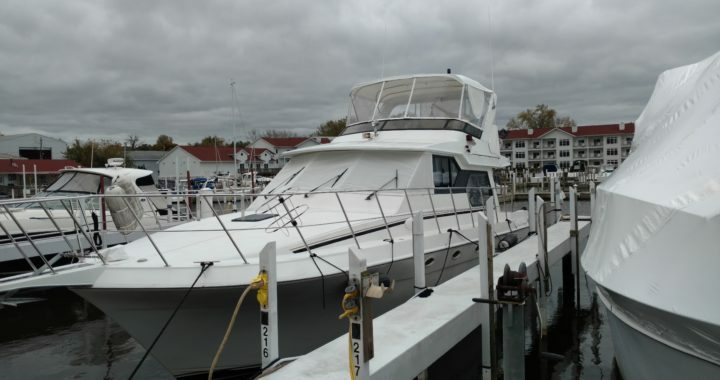 This 70′ Hatteras lost its bimini somewhere from Traverse City to Chicago. 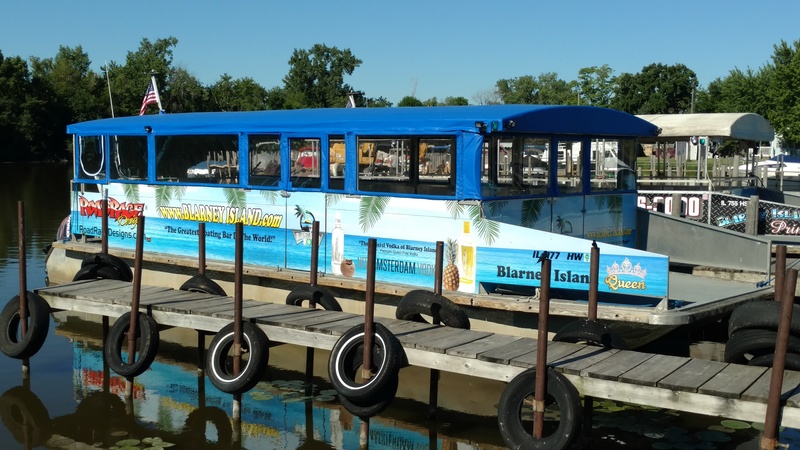 We got to create a custom bimini for this boat to help bring the shade back into these boaters lives! Our first step when we get a job is going on site to take measurements. We bring our 3d measuring device which is labor-saving and cost-effective. It saves us time measuring which saves you money at the end of the day on your new custom cover. After we gather all of our measurements we need and take lots of detailed photos we head back to the shop. We do all of our design work on the computer so we can physically see what we are creating, as well as be super accurate. This helps save us trips when we go to fit the new cover onto your boat. After we do all the design work we then bring it over to our plotter. This is another one of our tools that is labor-saving. Instead of us hand drawing out all of our designs, our plotter does it for us, quickly and efficiently. Then we hand all of our plotted fabric over to our seamstress, who cuts everything out and then starts the fabrication process. 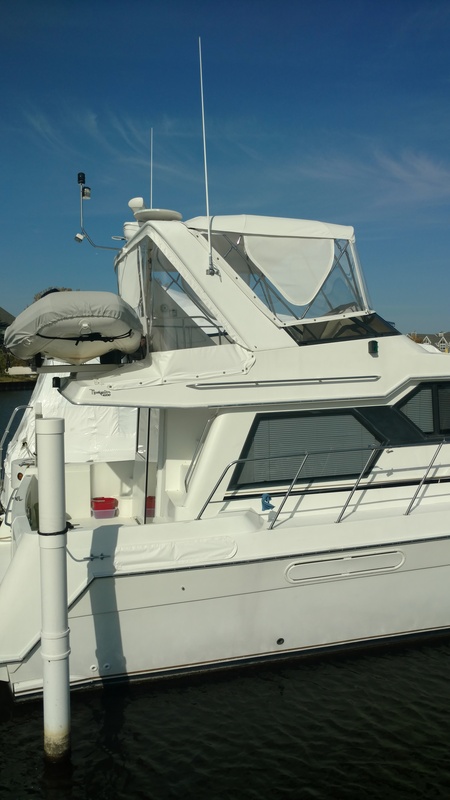 For this 70′ Hatteras bimini cover we used Stamoid fabric in white. Stamoid is UV, water, and fold resistant. It’s very easy to clean with just water! Check out this video to see Stamoids performance testing videos! To sew this up we used GORE tenara thread in clear. GORE tenara UV, saltwater, chemical, and extreme weather resistant. It is backed by a lifetime guarantee. We used lenzip zippers which also have a lifetime guarantee. We installed this cover on the day the Cubs won the world series! Go Cubs GO! 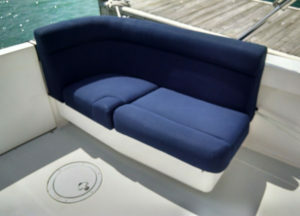 Check out these custom slip covers we designed for these boat seats! We created these waterproof covers out of Stamoid fabric, which is a rubbery material that is great for keeping things dry! 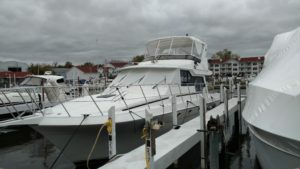 This 50′ Sea Ray Sundancer was in need of a new full enclosure. Here at Chicago Marine Canvas, we only do custom covers. That means, no two covers are alike. The first step of our process is to physically go out to your boat and take measurements with our 3D measuring device. This is one of the many tools that we use here in our shop that separates us from other canvas shops. With this tool we can quickly take measurements of your boat, which will save you time and money at the end of the day! After we gather all of the measurements needed, we head back to our shop and start our design process. We do all of our design work on the computer using CAD (Computer-Aided Design) software. This helps us visually by seeing the design before we draw it all out, so we can make sure everything looks perfect before we start to sew it all together. Once we finish that up, we head over to our plotter, which is another one of our labor-saving, cost effective tools, and we begin to draw out your new canvas. After everything is all drawn out, our seamstress cuts out all the pieces and begins sewing it all together. For this full enclosure, we used White Stamoid fabric. For the windows we used Strataglass. To sew it all together we used GORE Tenara thread. GORE tenara thread comes with a lifetime limited warranty. It is UV resistant, weather resistant and salt water resistant. That means no more restitching, ever when your canvas has GORE tenara thread on it! Our zipper of choice is Lenzip zippers, which also has a lifetime guarantee. This enclosure has 5 forward windows, and 9 aft windows, along with a 2 piece bimini. We also created 2 roll up windows on both the port and star side for air-flow when the enclosure is up. 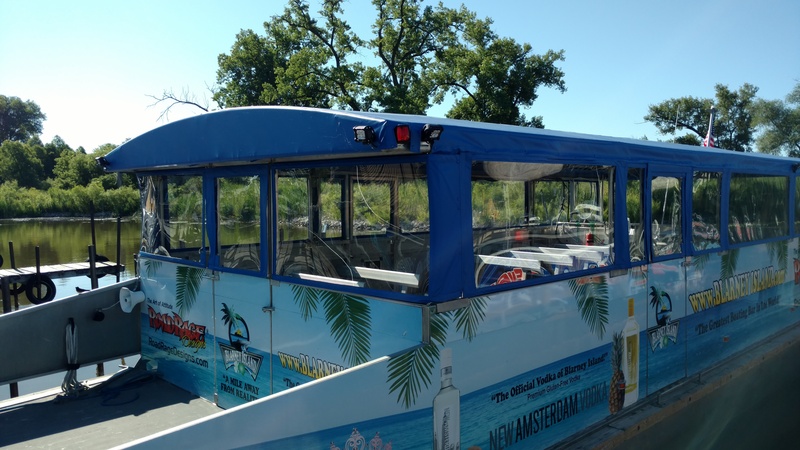 For this 42′ Navigator we designed a full enclosure with maximum visibility. 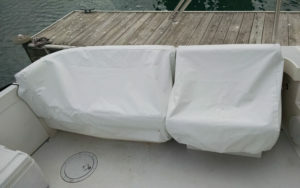 For this boat cover the customers went with Stamoid fabric in white. Stamoid is a material coated in vinyl and is very easy for cleaning. These boaters wanted to use Makrolon for their Forward windows. 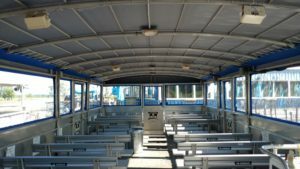 Makrolon is an a polycarbonate which is clear like glass material that is harder then other marine materials commonly used for windows. With Makrolon your windows wont bend and wont wrinkle, and wont scratch. 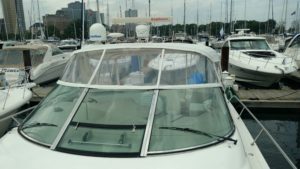 For their side and aft windows, the customer went with Strataglass, that way they could have roll ups for easy access to air flow while the enclosure is still up! 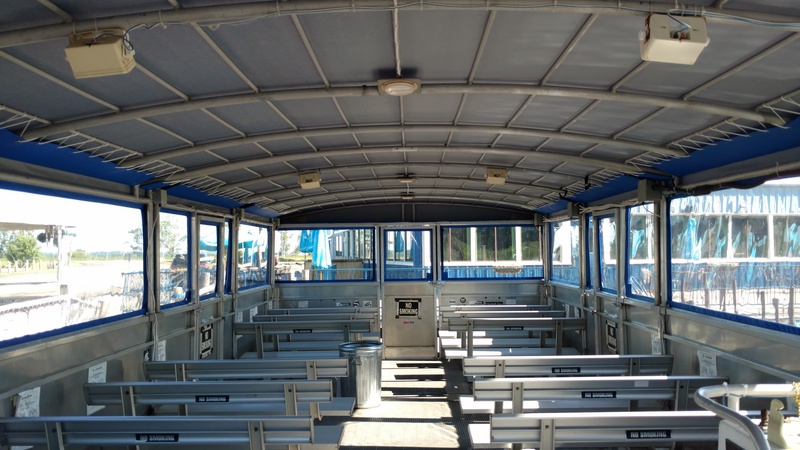 We created these roll ups with screens to help prevent any unwanted bugs from getting onto the boat. 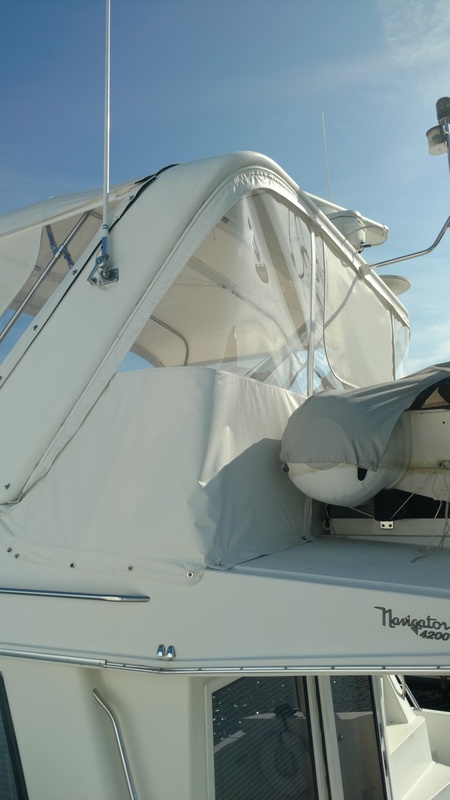 The forward windows attached to the bimini using Lenzip zippers, using GORE Tenara thread, both of these products are guaranteed to last a life time. 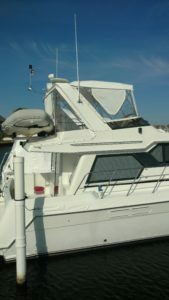 The aft windows are attached to the radar arch using kedar and water proof seal to ensure no leakage into the boat. 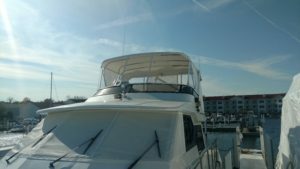 We also created a windshield cover for this boat to help keep the heat off the inside, and the windshield clean when no ones on the boat! This cover turned out great and looks super sharp on this 42′ Navigator!